Q: What was your role in the new Cascadia project? Faulkner: I’m the director of the new Cascadia development program, and my role is to oversee the new Cascadia from start to finish, from concept to production. This includes the development, supplier selection, truck quality, and its aftermarket readiness. Q: How many people were involved in developing the new Cascadia? Faulkner: Just about every department had something to do with it, from financing, to aftermarket, to marketing. More than 800 engineers and more than 1,000 people in the organization have touched the project. This includes employees in the U.S., Europe, Mexico, and India. The project has been a global collaboration. Q: Could you talk us through your process in the development of the new Cascadia? Faulkner: At Freightliner our focus is on improving the Real Cost of Ownership℠ (RCO) for our customers. So, the first step is to identify the main idea or key triggers based on customer needs. Then we begin to refine that main idea by producing an early B-sample truck incorporating some of those ideas. 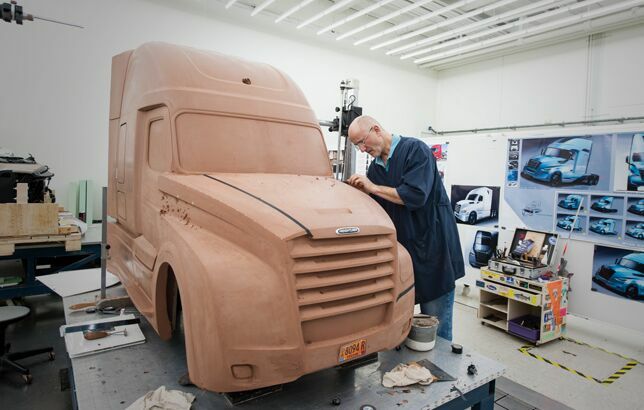 Next, we build a C-sample truck, where we’re almost ready for production. We spend two to three years testing that C-sample to figure out the reliability of the truck and to make sure it meets our goals. Once we feel confident the truck is ready for production, we produce a D-sample truck with parts developed directly from the suppliers. Throughout the whole process, our production team and manufacturing/engineering team are deeply involved in all of the designs to determine whether we’re at a point where we can build in a factory, and to ensure that we’re building good-quality trucks from day one. Q: What were you hoping to accomplish with the new Cascadia? Faulkner: The original Cascadia was on the road for 10 years by the time we launched the new Cascadia, so a lot of things have changed for our customers and the trucking industry over that time. Our number one goal for the new Cascadia was fuel efficiency. Our target was a 5% improvement over the current Cascadia Evolution, but we were able to achieve 8%, which is a huge achievement in our industry. We also needed to update the electrical architecture of the truck so it could handle the safety and connectivity systems we wanted to implement. Safety and collision mitigation are very important in the trucking industry, so we wanted to provide more features for our customers. We also focused on driver health and wellness. We wanted to give them an apartment feel inside of the truck, where they can prepare their own healthy meals instead of relying solely on truck stop food, and have a more comfortable life on the road. Q: How did customers play a role in the development of the new truck? Faulkner: A lot of customer feedback related to the cab’s interior, so we placed a high focus on reducing driver fatigue. We introduced an indirect lighting concept, so now the inside can feel more like a sky without any blinding light. We also created an interior loft that drivers can easily convert from bed mode to dinette mode. It turned out great and user friendly. We’re excited to see where that might go. Q: How have any of the Freightliner concept trucks impacted the design of the new Cascadia? Faulkner: Through the development of the Freightliner Super Truck we were able to achieve different aerodynamic and powertrain improvements, so we incorporated those learnings into the new Cascadia. We were able to take pieces of the safety system from the Freightliner Inspiration Truck that allowed it to drive autonomously, and put some of those innovations into production where it made sense to improve RCO in the new Cascadia. Q: In what ways is Freightliner pushing the boundaries of innovation for the industry? Faulkner: Definitely on fuel economy. As the only OEM with its own wind tunnel, we can use it as an asset where we can continuously play in the fuel economy sandbox and learn new things. In addition, we were the first in the industry to introduce connectivity, so we continue to innovate that technology and the interface to provide customers with tools that help them analyze and interpret the data. Q: Which trucking innovations do you hope to see on the road five years from now? Faulkner: I think connectivity will continue to evolve as we get more data from the truck. I think all of us will learn how to use it more intelligently to make decisions about maintenance intervals, create better safety systems, and improve fuel economy. Just starting to have the data I think, in time, will evolve it into a tool that will help the customer’s bottom line. If you focus on Real Cost of Ownership it means more profits for the trucking industry. Learn more about the new Cascadia.